Provided topographical survey, base map preparation, hydrologic/ hydraulic modeling, and prepare 30%, 60% and final construction plans. 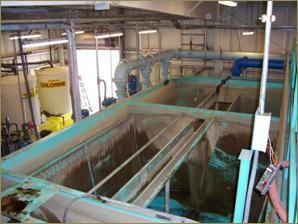 Design included NOAA compliant fish screen, sediment basin and two intake pumps. 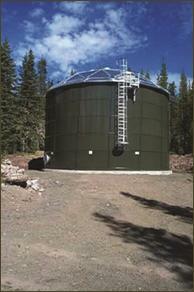 Provided coordination for the ACOE/DSL removal/fill permit application related to the work conducted in Turner Creek. Managed sub-consutlants including structural, electrical and geotechnical engineers. FDG provided topographical survey, base map preparation, design, and prepared the construction documents and specifications for the construction of 1600 lineal feet of water line replacement for the City of Estacada. FDG provided services to evaluate the existing raw water intake pump system to determine if new motors would result in an increase to the intake volume, and FDG managed replacement of the filter media, effluent and backwash pumps. This included the contractor disassembling the treatment tanks, sandblasting the old deteriorating paint and applying a new coating meeting the standards and specifications for potable water. Prepared the design and managed the installation of 2,100 lineal feet of 8-inch water main and appurtenances in E. Wy’East and E. Blossom Roads, for the Clackamas County Development Agency. Topographical survey, base map preparation, design, and NEPA permitting assistance to construct a retro-fit support structure to the existing raw water. Provided construction inspection services during construction. 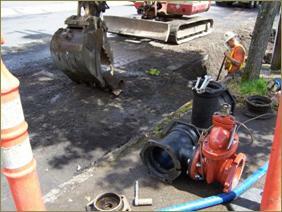 FDG provided design services to replace 420 lineal feet of failing steel water main pipes. Project entails right-of-way survey, topographical survey, waterline design and preparation of construction plans, bid specifications and contract documents. Topographical survey, base map preparation, hydraulic modeling, and prepare 30%, 60% and final construction plans. Provided coordination for the ACOE/DSL removal/fill permit application related to the work conducted in Turner Creek. Prepared the design and construction bid documents for a new 250,000 gallon bolted steel water storage tank, including associated piping and valving system for the Government Camp Water Company. FDG provided construction administration and oversight.